It is hosted by The Endurance International Group Inc (Massachusetts, Burlington,) using Nginx web server. There are 2 Nameservers, ns1.startlogic.com, and ns2.startlogic.com. 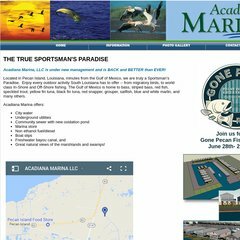 Acadianamarina.com's server IP number is 66.96.134.47. PING www. (66.96.134.47) 56(84) bytes of data. Pinging the server, resulted in a 35.6 ms response.